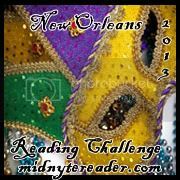 Midnyte Reader: 2013 New Orleans Reading Challenge. I absolutely love New Orleans! The magic, the music, the mayhem and the quiet moments. I try to visit as often as I can. I've heard people say it's an entirely different world, separate from the rest of the country with it's own unique history and culture. I love reading and learning about New Orleans and many times I choose to read a book based only on the fact that it takes place there, or the main character grew up there or the author stopped by there once...okay, maybe not that last one, but I just wanted to illustrate my obsession adoration for The Big Easy. Because I love reading about New Orleans, I thought I'd give myself more of an excuse to do so by hosting the 2013 New Orleans Reading Challenge. This challenge will run from January 1, 2013 - December 31, 2013. Books must be read and reviewed in 2013. You can choose fiction or non-fiction. You do not need a blog to participate. Books can cross with other challenges. You can join at anytime during the year. If anyone has any suggestions for this challenge let me know! Write a post about this challenge with a link back to this post. If you want to make a list of books you wish to read you can, but it's not mandatory. Sign up on the designated Mr. Linky below. Jazz Musician: Read 5-8 books. Mardi Gras King: Read 9-12 books. Voodoo Queen: Read 13-16 books. Link to the designated Mr. Linky below. Please leave a comment after linking! I'm going to try for the Gator Level. This is the SIGN UP Mr. Linky! (Use only to sign up for the challenge). Please sign up to your Challenge Post, not just your blog. Labels: 2013 New Orleans Reading Challenge. I will definitely sign up for this! I'm thinking of re-reading The Witching Hour, so that would work for at least the Gator level. I have to spend some time tonight deciding how many more challenges I'm going to sign up for, but in all honesty I love them and don't care if I overreach! I don't do reading challenges, but I do recommend Suzanne Johnson's Sentinel series, which takes place in New Orleans. I just finished River Road, and loved it. If you are into cozy mysteries, Laura Childs has a great series about a scrapbook shop owner, also playing in New Orleans. @Kate-I always seem to over reach. At least it's better than not trying! @lost-I hope you'll join me! @Aurian-Thanks SO much for the recommendations. I did read Royal St and I'm looking forward to River Road. I'll also check out the Laura Childs books.